See Chris Malta’s Top Ten ‘Wholesale Tips’. In video Tip 6, you’ll learn about a unique charge that some wholesale suppliers may require of you, as a new internet merchant, in order to set you up with a wholesale account. You’ll see the reason that wholesale distributors will sometimes require this charge, identify when this charge is legitimate (and when it’s not), and understand why it will not hurt your home business in the long run. 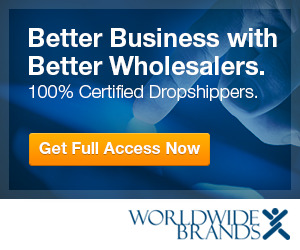 You will also discover which wholesale fees ‘real’ wholesale suppliers will never, ever charge your home business, and how these phony ‘wholesale’ fees can help you spot ‘fake’ wholesale suppliers and dropshippers from a mile away. Knowing what ‘real’ wholesalers will and will not charge will save you from the middlemen and ‘wholesale’ scam artists that prey on both ecommerce ‘newbies’ and experienced internet merchants.